From house mice to moles, there are many small rodents that can infest your residential or commercial property. Fortunately, Horizon Pest Control's rodent exterminators have the knowledge and experience needed to get rid of these pests. Learn more about the most common types of small rodents that can cause problems in New Jersey homes and New York City businesses. The most common rodent pest in the world, house mice have large ears, short hair and pointed noses. They’re smaller than rats and squirrels, measuring just 3 inches long, and vary in color from light brown to black. House mice are nearsighted, so they often move close to walls, and they’re great climbers. Often found in dark, less frequented spaces, house mice will build nests using paper, insulation and any other soft items they can find in your home or business. Because of this, it's important to seek out mouse exterminators to minimize damage. Small rodents with long, narrow, pointed snouts, moles dig burrows and tunnels underground. While they vary in size and color, they have clawed, paddle-like front feet that help them move through the soil. The mole is a common lawn pest that can be found in New Jersey and New York. Moles will chew on roots of plants, causing damage to trees and bushes. This can pose a problem if you have a garden or farm. More commonly referred to as meadow mice or field mice, voles are much like moles, as they burrow underground and feast on plant roots. However, they’re much smaller and have a short, stout body and hairy tail. They’re also more likely to find their way into homes and businesses. While voles prefer moist grassland to build burrows, they seek out warm places to birth and nurture their young, as well as food sources. Plus, voles can have up to 10 litters a year, which can quickly cause an infestation. Squirrels are easily distinguishable from other small rodents. They have slender bodies, large eyes and bushy tails. The color of their fur can be white, gray, yellow, red brown or black. Like house mice, squirrels are excellent climbers and can leap large distances. As a result, they often enter homes and businesses in search of food, water, shelter and warmth. 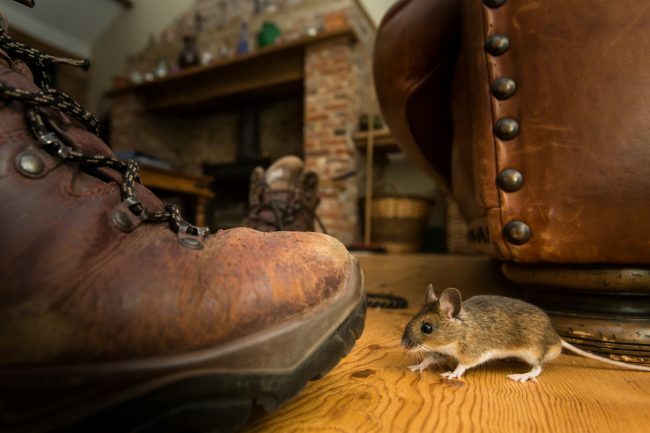 All small rodents can cause damage to properties, whether by uprooting vegetation or removing insulation, paper products, fabrics and other materials to build a nest. They also have the potential to transmit diseases to humans. If you suspect that a small rodent has taken up residence in your home or business, contact Horizon right away for a free consultation.